Top Notch Material: Two Fun Innotab Games for Children aged 4-7! Two Fun Innotab Games for Children aged 4-7! I had the pleasure of reviewing a couple of games for the Vtech Innotab Learning Tablet. The first game is from the Language Arts category for ages 4-7 years. · The Pixar Store is open, and it’s time to play! In Pixar Play for VTech's InnoTab Learning Tablets, explore fun games and activities featuring your favorite characters from Toy Story, Finding Nemo, Monsters University and The Incredibles! 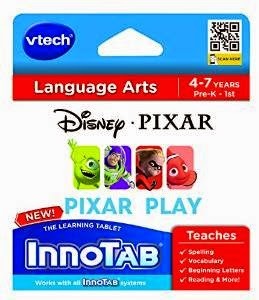 · This InnoTab Learning Cartridge includes a variety of features such as five learning games that introduce spelling, letters, vocabulary, reading, phonics and creativity, an e-Book that retells the story of the movie "The Incredibles," and allows you to take photos with your favorite Pixar characters. This game makes learning fun and interesting by teaching spelling, vocabulary, reading, and creativity. Your kids can also take their own photos and add their favorite Pixar character in the background. The characters in this game are from Finding Nemo, Monsters Inc, The Incredibles and Toy Story. It is a very fun game but a little too advanced for my youngest son, and fun, but a little too easy for my oldest son (7.) I know in a year or so this game will be a huge hit with my younger son though. The game is very colorful, fun and interactive and engages children very well with some of their favorite characters. 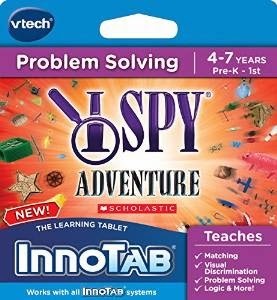 · I spy a fun-filled problem-solving adventure in this title for VTech's InnoTab Learning Tablets! · Kids can practice early reading skills as they read and solve I SPY riddles and play games to unlock 50 levels of play – each more challenging than the next. · Find, match and sore a variety of photo-realistic objects across four action-packed thinking games that build logic, vocabulary and visual discrimination skills. "I Spy Adventure” by Scholastic teaches the fundamentals of problem solving, logic and reasoning, vocabulary, rhyming, counting, sorting, matching and patterns. There are plenty of games to keep your kids entertained! Each game has 50 levels of difficulty. As with any InnoTab game you can download an app on your smartphone to track your child’s progress. My oldest son, who is 7, loves this game! he loves challenging himself and even me to see who can win in the matching games. I love going over the counting with my younger son, who is two. Again, the bright colors and animations keeps my younger sons attention and focus! Overall, both of these games and the Innotab Max are a huge hit for my kids. They have had so much fun trying out the different features and games available!